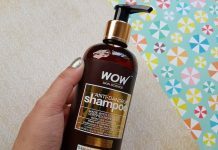 Hey everyone, today I’m reviewing the TRESemme Keratin Smooth Shampoo & Conditioner which I’ve been using for some time now. This hair combo is specially formulated to leave the hair smooth, straight and manageable. 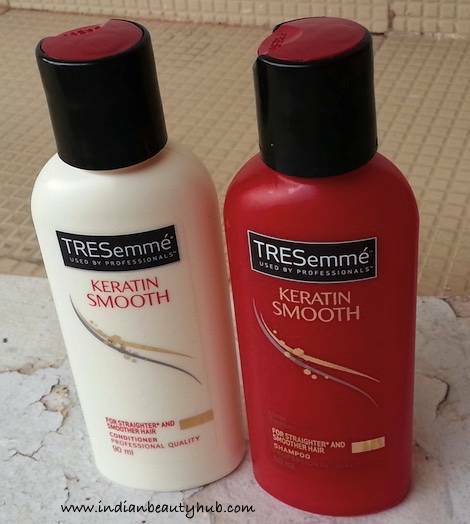 Packaging: TRESemme Keratin Smooth Shampoo (red bottle) and Conditioner (white bottle) come in sturdy plastic bottles with screw caps that further come with press button openings. All the product related information is also provided on the bottles. I bought the 90ml size variants which are compact and are easy to carry while traveling. 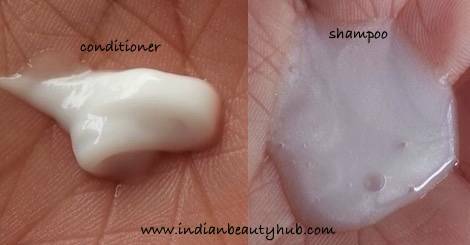 Texture & Fragrance: The shampoo comes in an off-white color and has a silky smooth texture whereas the conditioner comes in a milky white color and has a thick consistency. Both the shampoo and conditioner have refreshing citrusy fragrance which lasts for a day. 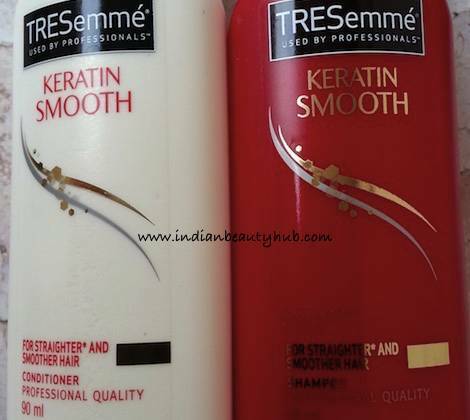 Price & Availability: The price of the TRESemme Keratin Smooth Shampoo is Rs.90 for 90ml, Rs.166 for 200ml, Rs.400 for 600ml and the conditioner is Rs.85 for 90ml & Rs.180 for 200ml. 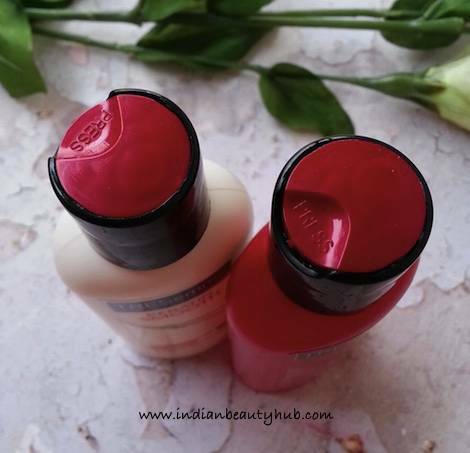 These are easily available at local beauty stores and online shopping websites like Amazon.in, Flipkart.com, etc. Efficacy: I generally dilute the shampoo with water and apply it on my wet hair. The shampoo lathers well and cleanses the hair & scalp very nicely. I usually shampoo twice during each wash to make sure my hair is clean and scalp is free from dandruff. It rinses off easily with water without leaving any residue. After that, I take a generous amount of the hair conditioner and apply it on my hair avoiding my scalp. I leave it on for 5 minutes and wash it off with water. 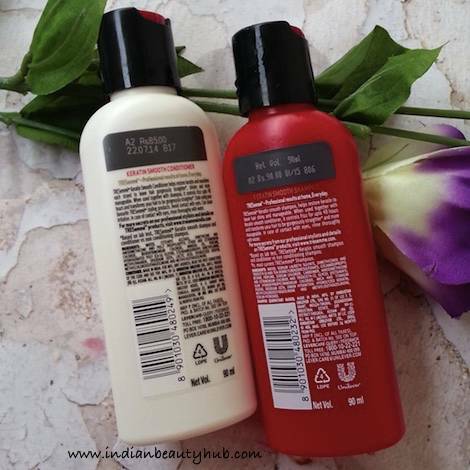 After every use of this shampoo & conditioner duo, my hair feels clean, smooth and manageable. 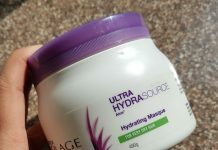 It keeps my hair frizz-free for up to 3 days which is amazing. I’ve chemically straightened & colored hair and this shampoo has not affected my hair color at all. I’ve been using Schwarzkopf shampoo & conditioner for past 5 years and normally do not use other brand products, but I am so glad I did. 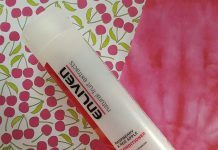 It really worked for my thick, frizzy and chemically treated hair. Cleanses the hair & scalp well. Leaves the hair clean, frizz-free and manageable for up to 3 days. Doesn’t fade my hair color. Suitable for thick, naturally wavy & chemically treated hair. Shampoo: Want hair that’s smooth, straight and easy to style? Use the shampoo specifically formulated to leave your hair gorgeously sleek and manageable. The TRESemmé Keratin Smooth Shampoo and Conditioner system transforms your hair, making it gorgeously sleek with less frizz*, smooth and easy to style. 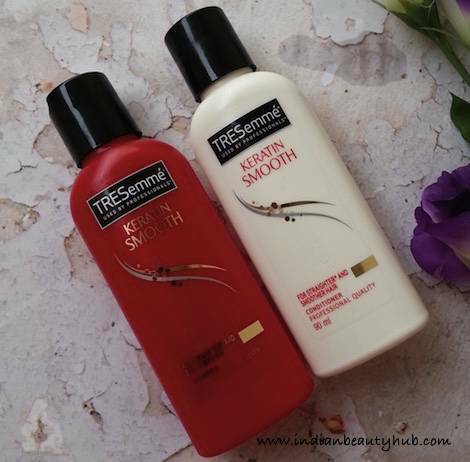 Overall, I really liked TRESemme Keratin Smooth Shampoo and Conditioner combo. It cleanses the hair & scalp well and leaves hair frizz-free and manageable for up to 3 days. I recommend this hair combo for thick, slightly wavy and color-treated hair whereas people with fine hair can skip these. Using this product for A while & It is quite Amazing.It will clean & make your hair smooth and thicker.One thing I found is that it will not Straighten your hair.How can just A shampoo straighten your hair.1 thing I hate is it contains a lot of chemicals & SLS which maybe can damage your hair.But ovearall A good Buy.